Though I am young, it seems I already suffer from chronic neck pain (the curse of being self consciously tall in middle school and looking down at my perpetually short friends.) Between chiropractors, muscle relaxers and massage, sometimes the only thing I can go to for dependable relief time and time again is my SoftHeat Heating Pad. 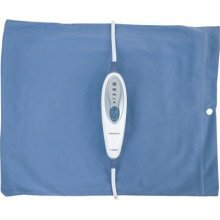 Of that many great specs on this heating pad, one of the most important is the auto shut-off. The heating pad I had as a kid did not have this auto shut-off, and more than once I would wake up in the middle of the night and feel like it was burning me. The fact that I can fall asleep with this heating pad worry free it quite nice. I also have a pretty high pain/heat tolerance, so the fact that there are four heat settings makes this product ideal for me. It delivers a good amount of heat to my hunchback neck and allows me to fall asleep pain free. The nine foot chord is nice because it means I can feel free to move around while I sleep instead of feeling confined to one position. The only annoying element of this product is a small detail dealing with the snap is uses to stay shut. In order to utilize the moist option of the heating pad, you have to put an insert that comes with the pad in water and then inside of the cloth casing that holds the pad. The effect is sort of the like a pillow case snapped shut. Well, more than once I have woken up with the pad outside of the case, and like Humpty Dumpty I have to put it all back together again. While I may not need all the King’s horses and all the King’s men to help me, it’s annoying that I have to do it at all. They need a better snapping system. 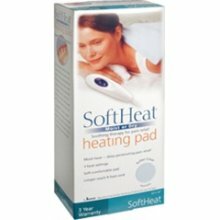 I would recommend this product to anyone, especially if you need higher heat to feel relief.